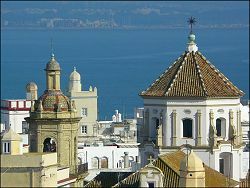 Effectively located on a small island in a wide bay, the city of Cadiz was founded by the Phoenecians and is believed to be the oldest city in western Europe that is still standing, and certainly the oldest inhabited city in Spain. 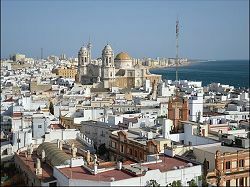 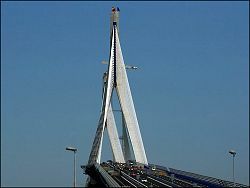 It was also important in Roman times and has been the main home of the Spanish navy since the 18th century. 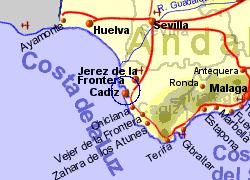 The old quarter of the city still has remnants of the city wall surrounding it but there are also newer sectors with wider streets and squares, some containing trees said to have been brought back from the Americas by Columbus. 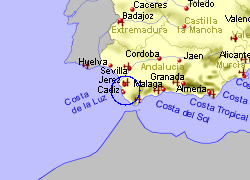 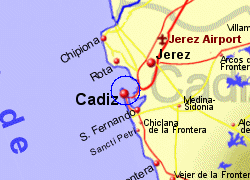 Map of the Cadiz area.